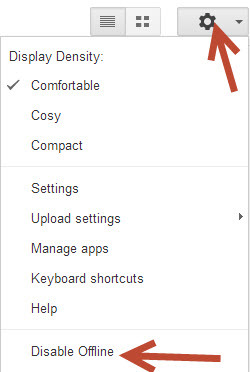 Google today launched new feature for it’s Google Drive service. Now any users can access Google Drive offline; which includes Google documents, spreadsheets, presentations, and drawings can be accessed without an Internet connection. You can also create and edit those documents on offline as well. 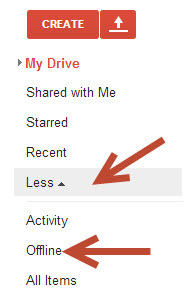 Here how to enable Google Drive offline access. Google today added some new features to google spreadsheets. With that update, Google also added some of the new features to Google Drive as well, like offline access of Google documents. Yes, now you can access Google drive including Google Docs, Sheets, Slides, and Drawings offline. One more good news is, now we can take all our documents offline and edit it without having any internet connection, and it automatically sync when you connected to internet. Now you don’t need to worrying about internet connection to open or edit your documents on Google drive. You only to need to setup Google drive offline access to start using Google documents offline. How this Google Drive Offline Access Works? Before we start using Google drive offline, first we need to setup our system and Google drive account to enable offline access. Once you enable offline access, you can view all you documents offline and make changes or edits to those documents without having any internet connection. Once you connected your device to internet, all the changes you made offline will get synced to your Google drive account. 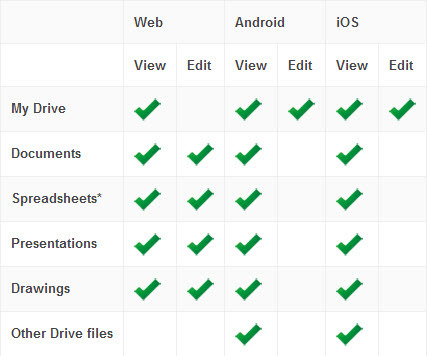 Which devices Google Drive supports Offline access? 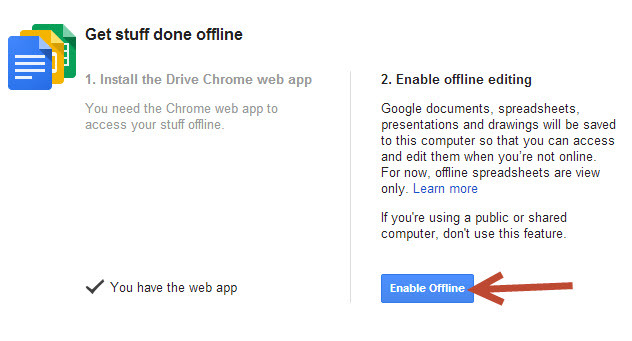 Currently Google Drive offline access is available only on Chrome devices. It’s means, either user should be using Google Chrome browser or Google Chrome OS to start using this feature. Don’t worry, it works fine with your windows operating system. To start using Google drive offline access with windows O.S, all you need to have is- a chrome browser. Offline access isn’t currently available for every part of your Google Drive. The table below indicates on what device you’re able to view and edit while offline. How to Enable Google Drive Offline Access on Windows? If you are an windows user, then first you should need to download Google chrome browser. If you already have chrome browser then open it. The first step is, installing Google drive chrome web app. Chrome browse by default comes with this app. If you have removed that app, then it will prompt you to install that app. Install it. In 2nd step, you will see “Enable offline editing” click on “Enable offline” button to enable offline editing for Google documents, spreadsheets, presentations and drawings. Just visit drive.Google.com when you’re offline to open these files. 8. Once you got that message, now we are ready for offline access. To access files offline, turn off your internet connections, restart your chrome browser and visit https://drive.google.com/#offline for offline access of your Google drive documents. Now you can make any changes without having any internet connection. Once your device is connected to internet, all your changes will be synced with Google drive.